In the Philippines, the term e-learning is used synonymously with online learning and concerns the online delivery of instructional content as well as associated support services to students. This article is primarily based on experiences at the University of the Philippines Open University (UPOU). It showcases the development of e-learning in the country from just a supplement within once-a-month face-to-face (FTF) sessions in a university learning center to more extensive use of a learning management system (LMS) as a venue for academic discussions as well as learning assessments, sharing learning resources and content, and students submissions of course requirements. Also discussed is how the mobile phone is being used to bridge the digital divide and make the digitally excluded sectors of the Filipino society become part of the online learning program of the university. The mechanisms being used to ensure quality education in e-learning as well as the challenges faced by e-learning institutions are extensively detailed. M. Dela Pena-Bandalaria, M. (2009). E-Learning in the Philippines: Trends, Directions, and Challenges. 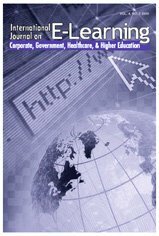 International Journal on E-Learning, 8 (4), 495-510. Waynesville, NC USA: Association for the Advancement of Computing in Education (AACE). Retrieved April 25, 2019 from https://www.learntechlib.org/primary/p/30504/. Bates, A.W. (2000). Managing technological change: Strategies for college and university leaders. Jossey-Bass: San Francisco, California. Dela Pena-Bandalaria, M.M. (2007). Learner satisfaction in an online learning environment. Unpublished Paper. University of the Philippines Open University: Los Banos, Laguna, Philippines. Dela Pena-Bandalaria, M.M. (2004). E-learning in a third world country: The Philippine experience. Unpublished Paper. University of the Philippines Open University: Los Banos, Laguna, Philippines. Dela Pena-Bandalaria, M.M. (2002). E-learning: Education opportunity and beyond for Filipino and non-Filipino offshore learners. Unpublished Paper. University of the Philippines Open University: Los Banos, Laguna, Philippines. Flor, A. (1995). Broadcast-based distance learning systems. University of the Philippines Press, Diliman: Quezon City, Philippines.